The simulacrum is never what hides the truth�it is truth that hides the fact that there is none. 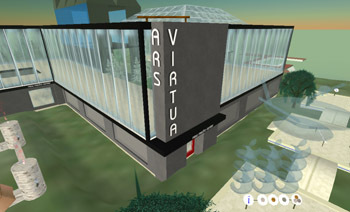 Ars Virtua is a new media center and gallery located entirely in virtual space. It was created to provide a venue for new genres of work, and as a platform to highlight working artists creating virtual sculpture, architecture, or applying scripts to extend these and explore the interaction of avatars with in 3-D space. Our purpose is to bring the museum into "new media" as opposed to vice versa and provide a platform for work that would otherwise not be accessible. Ars Virtua is a new type of space that leverages the tension between the 3-D rendered game space and the real, between the simulated and the simulation. It is the first in a series of projects that explore the virtual as the new real. To these ends Ars Virtua is instituting several programs: the first is the creation of an artist in residence program and providing 400 prims for the use of the selected artist. The second is to host an Ars Virtua New Media Conference early in 2006. To enhance understanding of virtuality, to develop the medium as a force for art production and provide a platform for transvergence with the intersecting media and knowledge fields. To provide a venue for development of work that cannot exist anywhere else and create a focal point for media and media industry. To promote the development of a commons in virtual space, a place where ideas can be exchanged across physical borders. To stimulate economic interest in virtual work and create a foundation for the exchange of goods in a new economy. 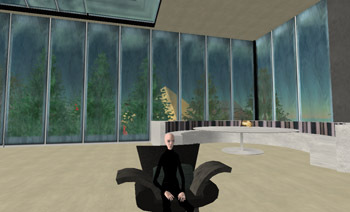 Second Life is a virtual world - a 3D online persistent space totally created and evolved by its users. Within this vast and rapidly expanding place, you can do, create or become just about anything you can imagine. Built-in content creation tools let you make almost anything you can imagine, in real time and in collaboration with others. An incredibly detailed digital body ('Avatar') allows a rich and customizable identity. A powerful physics simulation running on a backbone of hundreds of connected computers and growing with the population allows you to be immersed in a visceral, interactive world that as of April 2005 covers more than 12,000 acres and 20,000 owned plots of land. The ability to design and resell 3D content, combined with the ability to own and develop land and a microcurrency, which can be exchanged to real money means that you can build a real business entirely within Second Life.